← Carloway: clarity or confusion? Print subscribers were treated to our first all-colour issue last month and feedback so far has been great! Helium climbs back The current situation analysed and the likelihood of helium tanks being ‘diluted’ with air. USA vs Europe. Unsung birth of the helium method Helium brought a new era to self-euthanasia, but who brought us helium? Rising costs of death You’ve worked out your insurance policy and how to take things into your own hands should the need ever arise: but have you factored in the cost? Eavesdropping on your decisions? Emailing someone about your end of life decisions? When government invasions of privacy can mean you door can be forced open. The print magazine is aimed at mature adults who want more specific, practical information to look at the long term of having a safety strategy, a “key to the door marked ‘Exit. '” If it is news and updates you are looking for, those are available free from many sources, including this Blog (please scroll down the right-hand side for links to online news information from professional bodies and sister organisations). You will also find a search box to look for specific blogs on particular subjects and some links to various laws around the world. A big thank you again, both to out Blog and Print subscribers, for all your feedback and support! How do I subscribe or obtain an issue? Is Mexico still a viable option to acquire Nmbtl and return to US? Are border agents confiscating purchases, or requiring bribes, as d humphrey remarked recently? 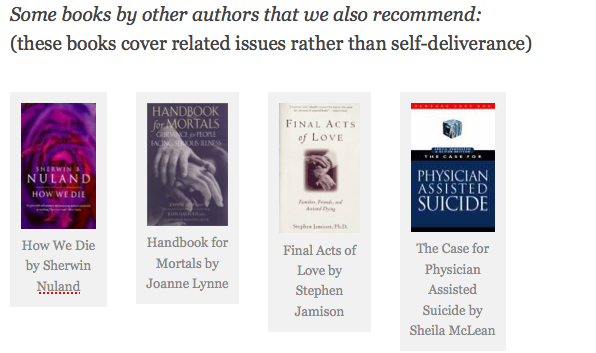 Subscription is relatively straightforward: http://www.euthanasia.cc/new_app.html. We would suggest you read the form carefully before sending it off. It is helpful to include proof of age. We do not actually recommend the Mexico option as availability changes so frequently, and prosecution, extortion and scams are a constant possibility, It is possible, but requires much dedication and quite a bit of risk. Derek Humphry is on the ground in the U.S. and quite correct in my opinion for issuing such warnings, though others still take that route.